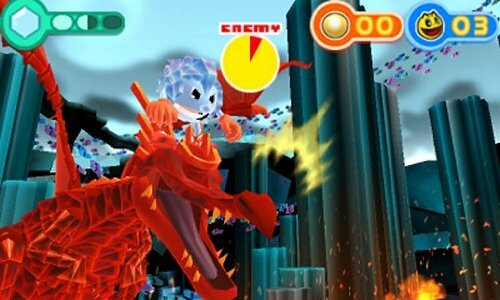 Previously on GameView, I had the chance to check out and review NamcoBandai's latest Pac title – Pac-Man and the Ghostly Adventures on Playstation 3.In my "The Bad" section I pointed out a few things that would have made the event a bit more pleasurable. Well no soon after that review I received the 3DS version, which I was told would be a different experience. And I'll be damned if it contains all the things missing from the console version. However, does that make it a better game? Let's find out as we dip into Pac-Man and the Ghostly Adventures on the Nintendo 3DS. 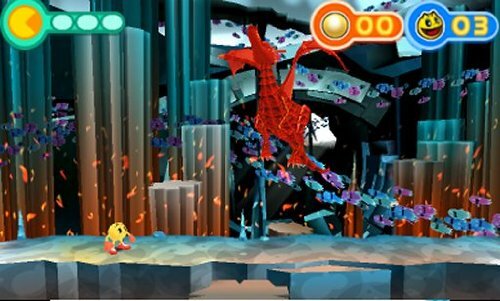 In the handheld version of Pac's latest version, you tackle seven themed stages in 2D side-scrolling style as you protect the people of Pacopolis from the evil Betrayus and his ghostly minions. You can play each world in any order and once you've completed a world, you can always go back in to get special items left behind. Sometimes those items can only be reached once you gain certain abilities, so it's good to head back in, especially if you're a completist. And while Betrayus may have his ghostly ghouls, Pac has the help of his friends who will aid him or need him for protection. And you'll need all the help you can get as you face off against slime tossing, spear wielding, squid-like, and fire and ice ghost types amongst others. But you not only have your friends for backup, nay they only come around at certain points in the game. And the rest you'll have to tackle all on your own. 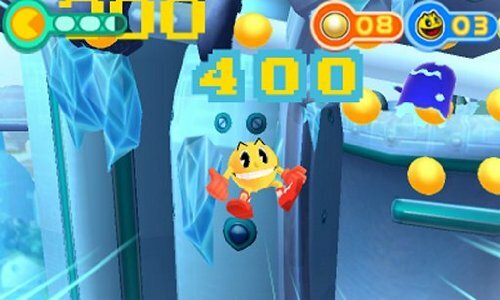 With that, you have the use of special pacberries that for a limited time, gives Pac-Man some unique abilities such as becoming Chameleon Pac and using a long tongue to reach higher levels or Fire Pac who can toss balls of fire to take down obstacles as well as ice ghosts. You only get so many uses of these abilities, but as you progress through each stage as well as find Pac fertilizer, you'll start to increase the number of uses, which can be accessed from the lower touch screen. 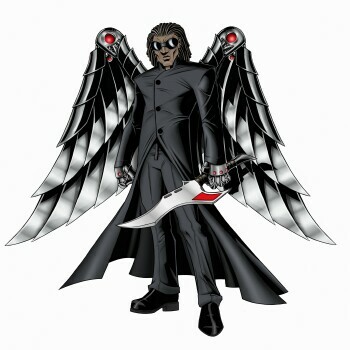 Once you've run out of uses for your super Pac powers, you're ghost pals will come to your rescue to replenish your stock. 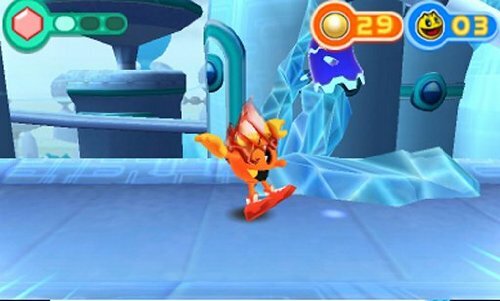 There are some abilities that are even more unique and cannot be accessed from the touch screen such as Springy Pac or Boulder Pac. You'll either be given a special cutscene or you'll find a hint bell detailing this one time ability. Speaking of hint bells, there are many strewn through each world that will offer advice on how to tackle a certain section or how to defeat a boss character. 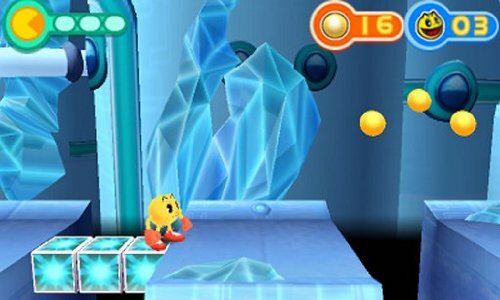 So basically, the 3DS version of Pac-Man and the Ghostly Adventures is more of a stripped down version of its big brother on the consoles; while the game loses a lot in terms of having Pac hang out in his school and lots of voice, it gains in a few areas I really wanted to see in a Pac-Man action game. So let's dive in with the TOV Breakdown and see how well the handheld title fares. 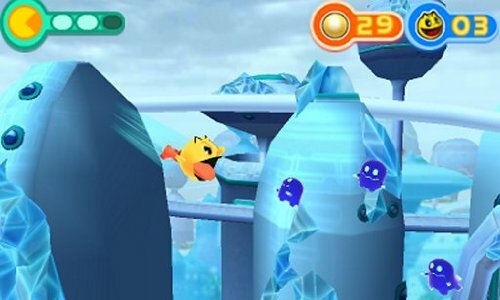 I'm all about 2D Side-scrollers and Pac-Man and the Ghostly Adventures on the 3DS is exactly the game I wanted the console version to be; it's simple, straightforward and loads more fun because you're not always falling off platforms to your doom and you have a scoring system, which works given all the chomping you get to do. Control wise, there are some hiccups (explained in the next section), overall Pac controls well and you're able to pull off all his moves with ease. Graphically the game looks great, Pac is well defined and the backdrops are freakin sweet with beautiful bold colors and in some areas you get some nice background animations. The sounds are hit and miss, though you get some decent tunes and clear audio effects. In the end I was extremely pleased with this version of Pac's latest adventure, though missing a lot from the console version, it can still hold its own and somewhat exceeds its bigger brother. As much as I enjoyed my romp through the handheld version of Pac's latest adventure, there still quite a few misses that deter it from being perfect. 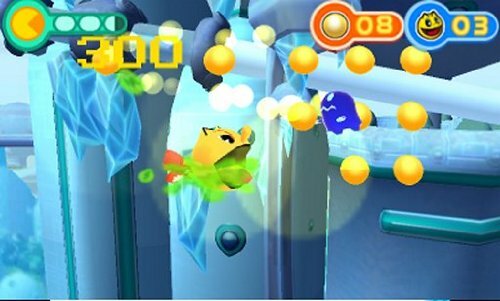 For one, the console version of Pac has a double jump, but for the 3DS you have to hold down the jump button in order for Pac to do this floaty run that gives him an extra boost. I'd rather have the double jump as this new move is quite annoying to perform. Why can't I simply do a double tap and be done with it? Next, the console version has a lot of cool sounds from Pac's past such as the familiar sound when Pac chomps on a ghost; in this version, when you chomp a ghost, they scream, moan or groan. In some cases it's chuckle-worthy, in others it's just… meh. When Pac chomps on the bigger ghost, it's sort of demented as he doesn't do it in one bite – he does it in several. The dude is one mean, chomping SOB. 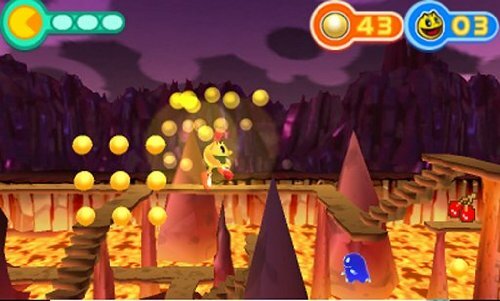 Pac-Man and the Ghostly Adventures for the Nintendo 3DS is available now and I'm just gonna say it, it's a better experience than playing the console version. Sure it's scaled down, doesn't have as many cinematics or sounds, it does however plays nicer and has a lot of nifty features that makes the experience worthwhile. 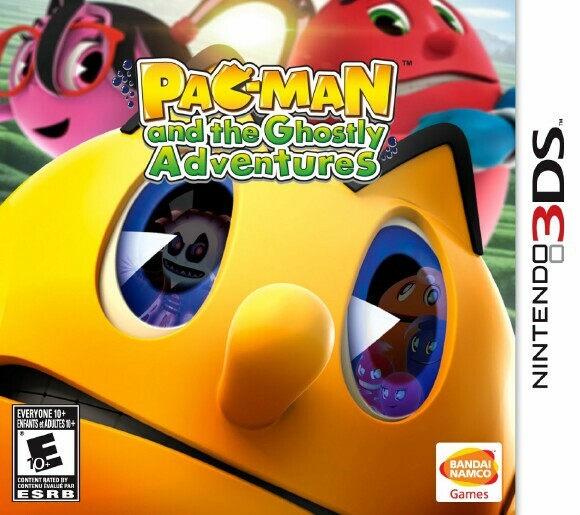 And out of TOV 5 stars, I'm giving Pac-Man and the Ghostly Adventures 3DS version 4 stars out of TOV 5.